I love salty crunchy snacks, so much so, that I would even say it is my achilles heel. My snack of choice has long been potato chips, but I am always on a mission to come up with a healthier alternative. Enter my raw vegan okra chips. These are un-fried, raw, and good for you! Salty and crunchy just like potato chips with a hint of okra flavor. Okra is packed is vitamin A, B, C, K and minerals like potassium and calcium. 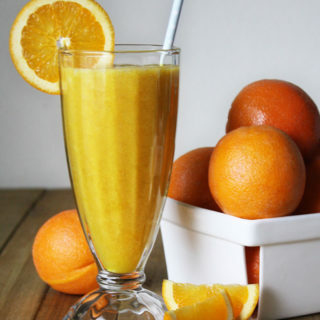 High in dietary fiber and low in calories so it makes not only a healthy snack but also a great low calorie snack when you are trying to lose weight. 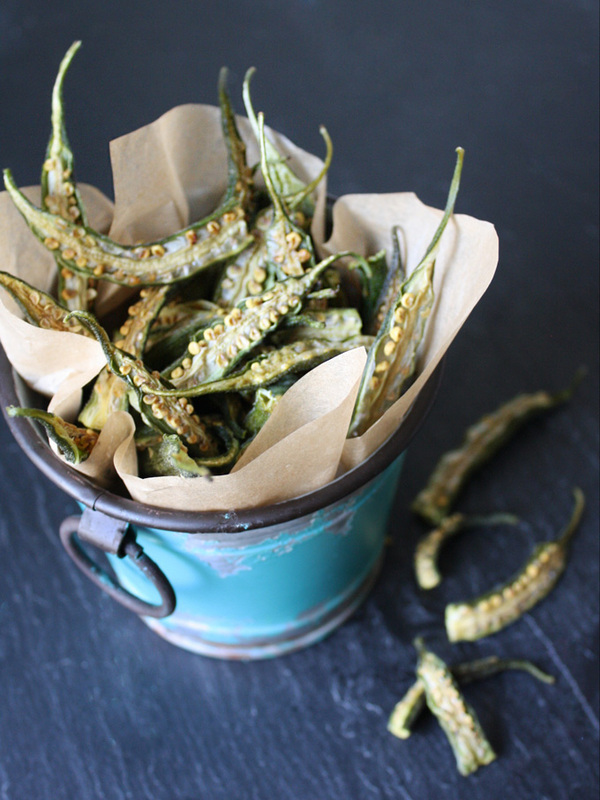 If you like okra, you’ll love this crunchy, crispy snack! 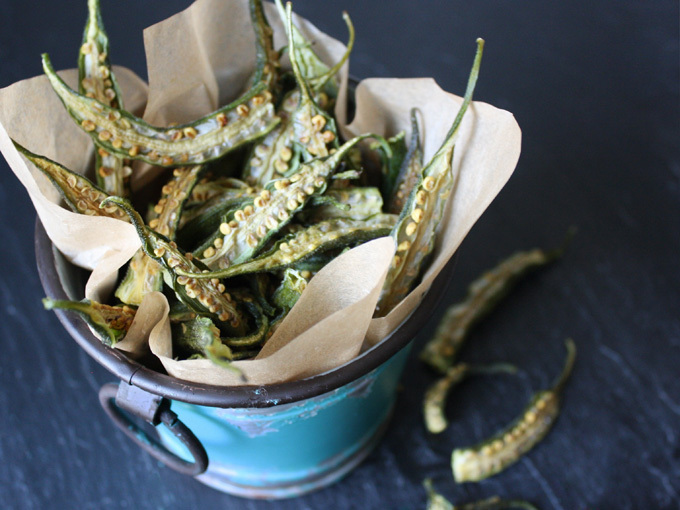 Making these raw vegan okra chips are super easy. 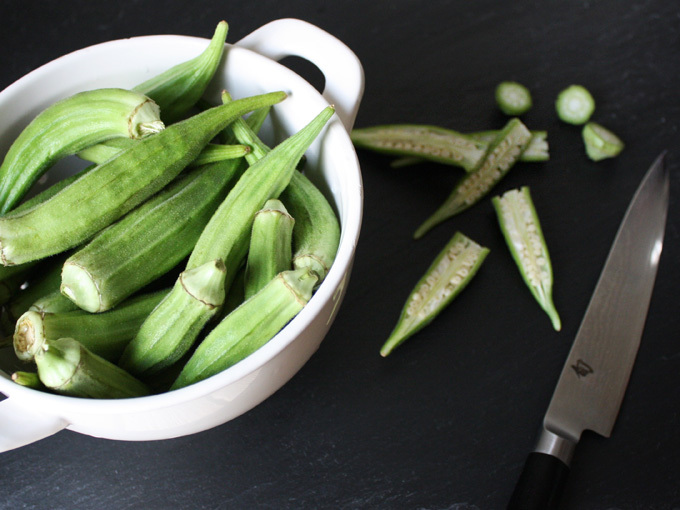 Cut off the tops of the okra and slice them in half, lengthwise. 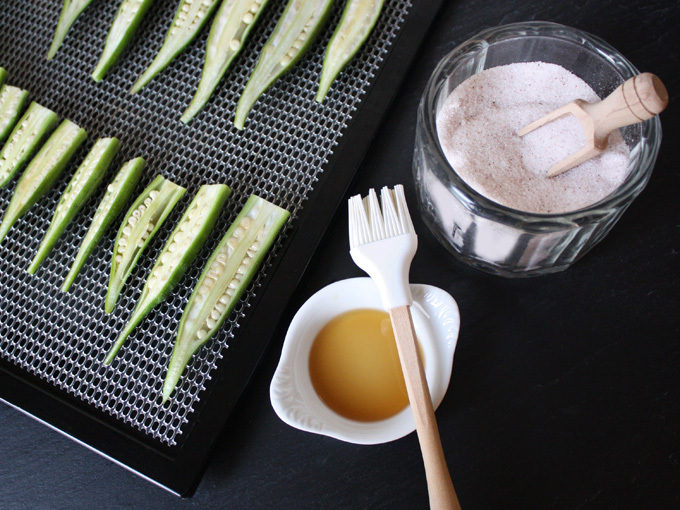 Line a dehydrator tray with a mesh sheet and place the okra slices spaced evenly. Brush the toasted sesame oil on them and lightly sprinkle some salt on each of the slices. 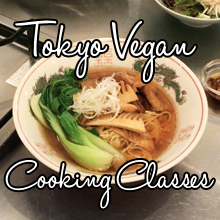 You can use your finger instead to rub on the toasted sesame oil as well. Dry in the dehydrator at 115°F for 36-48 hours until the okra slices are completely dry and have turned into crunchy okra chips. Store them in an airtight container and enjoy them anytime you get the munchies. They last for 2 weeks but I have a hard time not devouring the entire thing in one sitting. Enjoy! Clean and dry the Okra. Cut off the tops of the okra and slice them in half, lengthwise. Line a dehydrator tray with a mesh sheet and place the okra slices spaced evenly. Brush on some toasted sesame oil and lightly sprinkle some salt on each of the slices. Dry in the dehydrator at 115°F for 36-48 hours until the okra chips are completely dry. If the okra chips gets stale while storage, pop it back in the dehydrator on 115°F for a few hours until it regains its crispness. Looks wonderful! I either love or hate okra, but these look absolutely delicious!